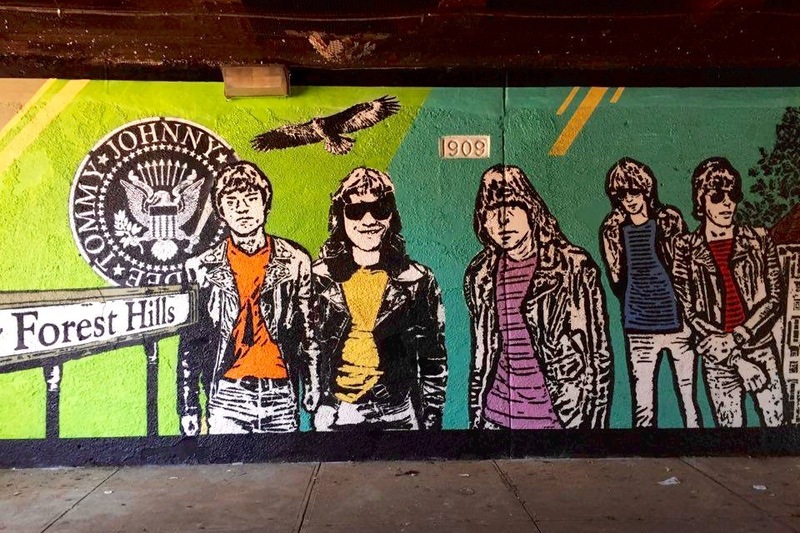 The Ramones Mural by Ori Carino at Thorneycroft Ramp in Forest Hills. Oh oh Forest Hills loves you so! "The Ramones are a little of each," he joked. The black-and-white mural was painted at the Thorneycroft Ramp, a path leading to the rooftop of a garage at the Thorneycroft Apartment complex on 66th Avenue, near 99th Street. That's where the original band members — Jeffrey Hyman, known as Joey, Douglas Colvin, better known as Dee Dee, Thomas Erdelyi, or Tommy, and John Cummings, later known as Johnny — who all met at Forest Hills High School, used to hang out as teenagers in the late 1960s and early 1970s. 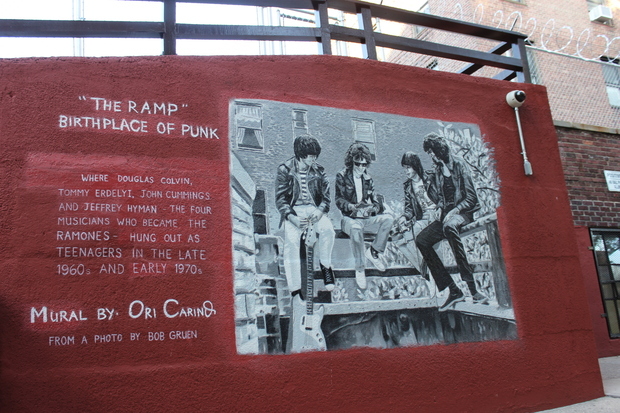 Created by artists Ori Carino, the mural is based on a 1975 photo taken by Bob Gruen, depicting the band members sitting atop the ramp. The second mural, completed on Thursday morning, was painted by artists Crisp and Praxis Graff, on the wall under the 71st Avenue Long Island Rail Road overpass, near the Station Square area. The colorful mural, which features the band, the Forest Hills Stadium and Station Square, was the initiative of the group behind summer concerts at the stadium who teamed up with 501 See Streets, a nonprofit that works with local communities to beautify neighborhoods through art. "Improving the underpass has always been a goal of ours, and we thought a mural highlighting the history of Forest Hills and the Stadium was a great way to celebrate the neighborhood," said Jon McMillan, one of the concert organizers. Most concertgoers will have to pass by the mural on their way to the stadium. Locals embraced the new murals. “Finally our neighborhood has some public art to look at,” said Stephen Melnick, a Forest Hills resident, who last year successfully pushed LIRR to remove graffiti from the walls of the overpass, where the second mural was painted. Concert organizers said they are also planning to paint another mural on the wall across the street, this time featuring tennis-related themes, which would touch on the history of the West Side Tennis Club where the stadium is located and where the U.S. Open was originally held until it moved to Flushing in 1978. “It’s a great idea to use a drab and dirty space. And now they are bringing new life to it,” added Melnick. “It’s also a good way to connect the community to our past and to what is happening now at the stadium itself,” he noted, referring to summer concerts that have resumed at the stadium several years ago after a decades-long hiatus.